◆Bluetooth BK4.0.wireless module-stable alto and clear treble voice perfect, excellent sound quality. ◆Battery life strong- Built-in 4400 mA large rechargeable Li-ion battery,lasts for up to about 6hours standby time per charge. This soundbar is for bluetooth connection, cannot connecting to TV. If you have any problems about the bluetooth soundbar, please don't hesitate to contact us.We will try our best to give you the perfect shopping experience. 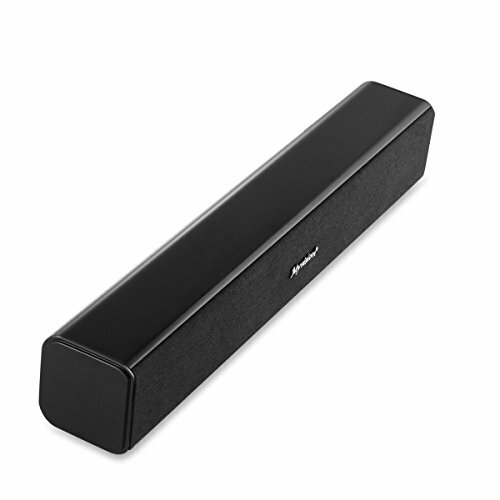 SPECIAL DESIGN - The Bluetooth Soundbar is AntiMagnetic, AntiNoise and HQchipset. With LED indicator light and spin button more easy to operate.Built-in 4400mAh rechargeable Li-ion battery supports up to 7 hours of playtime. 3D SURROUND SOUND - Subwoofer (Wireless),10W *2 speakers,Digital signal processing (DSP) system accompanies with high-fidelity sound system give you an upgrading fantastic home theater surround sound experience. WIRE OR WIRELESS CONNECTIONS - Modern and traditional devices work with the wireless speaker thanks to Bluetooth (effective distance:12 meters/39 feet) or wired connections that include 3.5mm, Optical, Coaxial, and RCA AUX input easily works with any devices you want, such as smart phone, iPad,and DVD player etc. MULTIPLE FEATURES AND MORE INTELLIGENCE-With built-in microphone supports hands free calls.Automatic sleep function, more energy saving, 10 minutes without the use of automatic sleep function. WHAT YOU GET - Bluetooth Speaker, Power Adapter, USB Cable, 3.5mm Audio Cable, User Manual". We provide 12-Month Warranty and Friendly Customer Service.